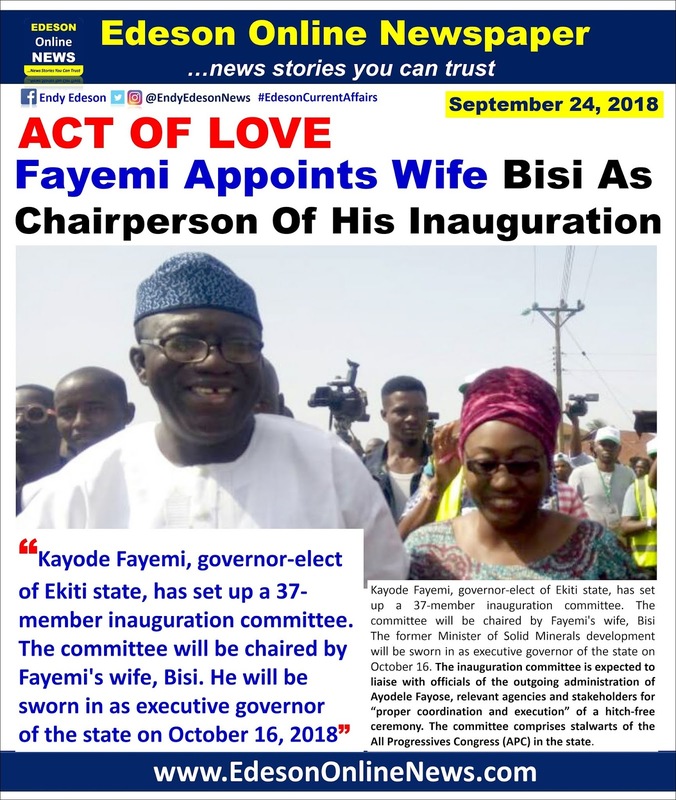 Kayode Fayemi, governor-elect of Ekiti state, has set up a 37-member inauguration committee. 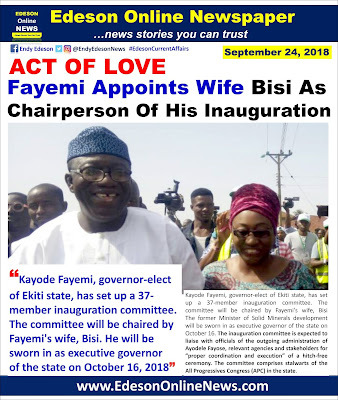 The committee will be chaired by Fayemi's wife, Bisi. The former Minister of Solid Minerals development will be sworn in as executive governor of the state on October 16. The inauguration committee is expected to liaise with officials of the outgoing administration of Ayodele Fayose, relevant agencies and stakeholders for “proper coordination and execution” of a hitch-free ceremony. The committee comprises stalwarts of the All Progressives Congress (APC) in the state. Boss, you term this an act of 💗 love. That’s why Nigeria is where it is today. We always mix official matters with family affairs to the point we do not know where to draw the lines. At the end of the day the job is never done cos it’s all family affairs as we have no strong work ethics where family is involved. I done waka my own. Just saying.....! Though, If there was no love between them, he wouldn't have given her such responsibility. Nothing wrong with appointing his wife to lead the committee if she has the capacity. Bill Clinton always used his wife to head committees even as governor up till even when he became President. APC will always be APC. Fastforwad here, this is just d beginning of their plans, all his other families will soon assume some post. Lastly family love does not comes from politics... Thats the understanding btw the two of them. The Americans know where to draw the lines where families are involved. Husband & wife can work in same place, 90% of the time the law does not allow them abuse that privilege. But if they do, if caught, they face the full extent of the law but our case in Naija is different in this we country. Just husband alone, it is a lot of trouble, embezzlement & when the wife come join na abuse of power be that oh, they steal until they don’t know where to keep the money again. I still maintain my stance, we do not respect work ethics where family is involved as we allow favoritism be the order of the day wc messes with getting the job done. I know what I am talking about. I wish una goodluck! Hmm mm mm mumm we shall see. we always get it wrong in this country, why should his wife come into this committee? this is not family affairs ,it abt govt of a state. we should stop comparing Americans style of life/ govt with our own, if Clinton appoint his wife on anything they know where to draw the lines, beside there should be consideration for ethics too in our governance. to me its not ethical culturally as a learned/cultured person to put his wife in that committee not to of her been the chairperson.